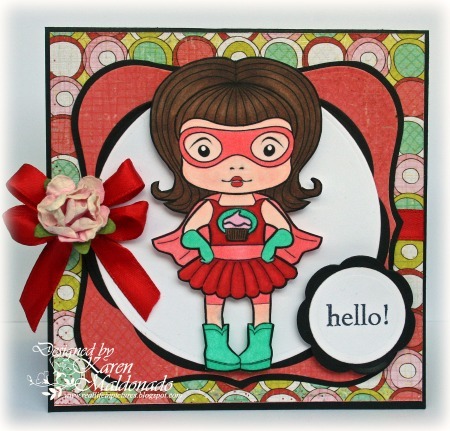 La-La Land Crafts Inspiration and Tutorial Blog: Hello from Super Cupcake Marci!! Hi there! It's Karen here!! Today, I am sharing a sweet little card I made using Super Cupcake Marci!! Marci's just stopping by to wave "hello" to you today!! I thought it would be fun to pick up the beautiful, bright, and festive colors in this Crate Paper designer paper!! ﻿If you are interested in purchasing any of the Maric or Luka stamps, feel free to drop by the La-La Land Store!! Also, available in digi are the NEWEST Fancy Marci and Formal Luka!! Have a SUPER Cupcake kind of day!! She looks terrific in these bright bold colors :) Love the shapes too!... and your "Fashionably Karen" bow is fabulous! Oh how happy and heroic is she? Love her red skirt and sassy fun papers! she is making me want a cupcake right now! AWE! What a super cute card!!! I recently bought her. I have her colored up just haven't finished making the card to put her on. Hopefully I will get it done before end of the month so I can post on the customer gallery to be entered into the monthly drawing!! VERY cute and I love that paper!